Eat a bug! Exotic culinary creations from our bug chefs. It's an adventure in eating! Insects are an important source of protein in many cultures and a culinary delight if cooked correctly. Grab a seat and watch our amazing chefs incorporate bugs into their dishes—and sample some of their exotic creations at Bug Appétit. Audubon Butterfly Garden and Insectarium is "enhancing" the signature delicacy of the Carnival season for those craving something a bit more exotic. 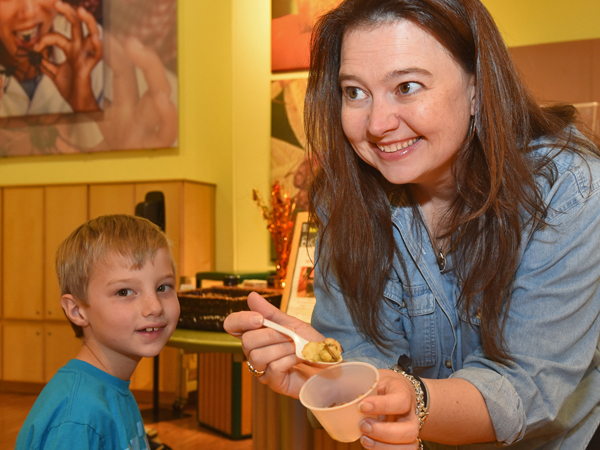 Cricket king cake is available to sample in the museum's popular insect kitchen, Bug Appétit, through Lundi Gras! At Audubon Butterfly Garden and Insectarium, we like to celebrate the holidays, bug style! Why would Mardi Gras be any different," said Jayme Necaise, Director of Animal and Visitor Programs at Audubon Butterfly Garden and Insectarium. "Because king cakes are a big part of the Carnival season, we decided to offer our guests a chance to eat a special cricket-topped king cake." Delicious edible insect dishes are served from 10:30am to 4:00pm each day.